Bigger seat, rail and platform for better results. Optimum comfort! The seat's extra wide. The shooting rail's extra large. And the platform's nice and big, too. All those extras add up to a longer, more successful hunt. And you'll like the HUGE SAVINGS, too! 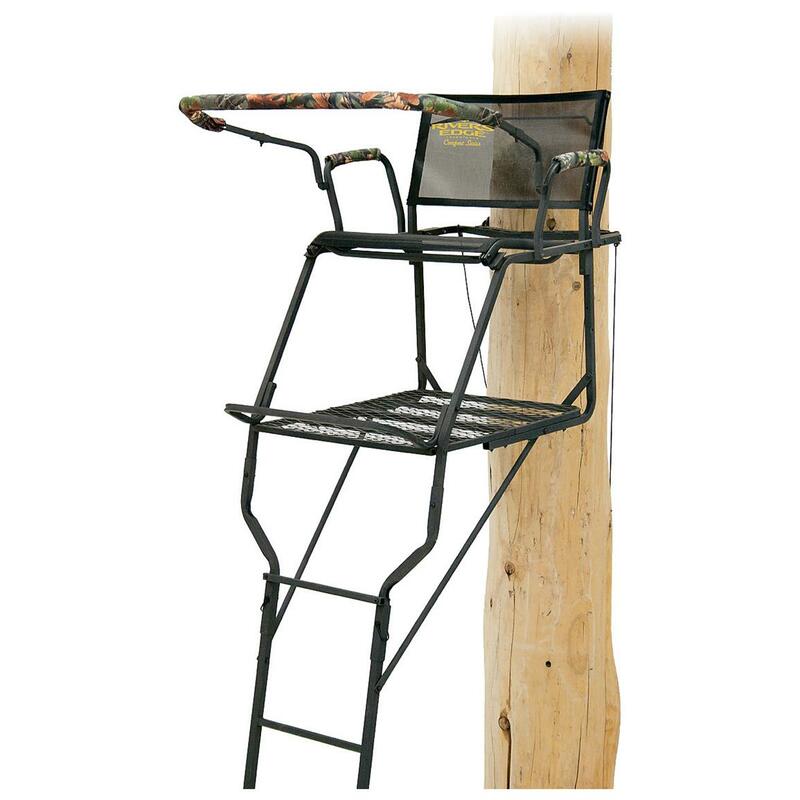 Platform Dimensions: 30"w. x 26"d.
Seat Dimensions: 26"w. x 15.5"d.
Rivers Edge Jumbo Jack 17 Ladder Tree Stand is rated 4.5 out of 5 by 31. Rated 5 out of 5 by Burt47 from Roomy & comfortable Assembly of the seat is tricky but product is well designed and sturdy. Rated 5 out of 5 by Steve from Very comfortable Have hunted this stand a few times now. Very sturdy and very comfortable. Can easily take a nap and miss the big one. Only down side is shooting rail is not adjustable. 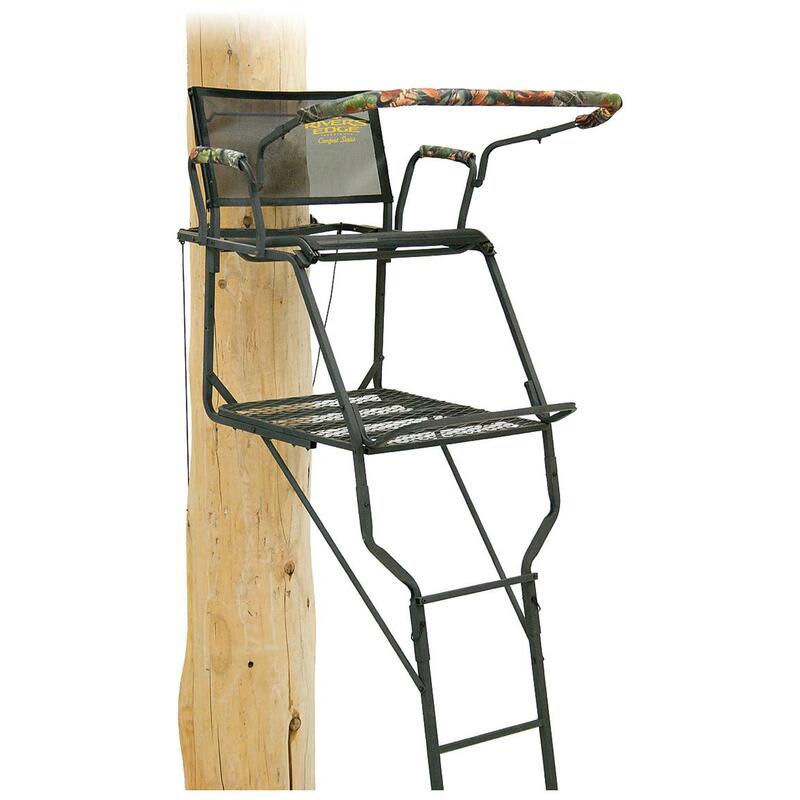 Rated 1 out of 5 by Lenny from Terrible to put togeather This tree stand has to be the worst ladder stand in the world to put together. If you do not want to spend days and don't have a lot of help putting together . DO NOT BUY. It was a complete nightmare, had to have to guys come help just snap seat in place. Rated 4 out of 5 by Big Jim from Great stand for the money The stand was extremely roomy and the only issue I had was being too short. The seat was deep, built for a long leg guy and I didn't care for the big gap between the bottom of the back support and the seat. I would also like to see the shooting rail be adjustable height. Rated 5 out of 5 by Bdonzi11 from Unbelievable comfort Somewhat easy to assemble ,very durable and extremely comfortable !! Rated 5 out of 5 by Jmsbragg from Solid construction, really roomy! If you are looking for a good ladder at a really fair price that is REALLY roomy, this is the one you want. I was really just in the market for a shorter version of the uppercut, as I prefer a narrower seat that kind of cradles me and makes me feel a bit more secure. This one is really wide. Not my thing, but it is what was advertised. The construction seems really solid; it seems like it should last. Nice ladder!